World Refugee Year (WRY) was an ambitious attempt by the UN, by governments (mostly in the First World) and NGOs to increase public awareness of enduring refugee situations and to find solutions such as resettlement or local integration that would improve the lives of refugees around the world, not just in Europe but also in the Middle East, Hong Kong and China. In addition, it was hoped to improve the visibility of the Office of the United Nations High Commissioner for Refugees (UNHCR) and to get more governments to sign the 1951 Refugee Convention. A particular focus was the plight of DPs and refugees who were still living in camps and other sub-standard accommodation in Germany, Austria, Italy and Greece, 15 years after the end of the war. More than 60 countries participated in the campaign between June 1959 and June 1960. Britain played a prominent part, as did other countries including Norway, Sweden, Germany, Canada, the United States, Australia and New Zealand. 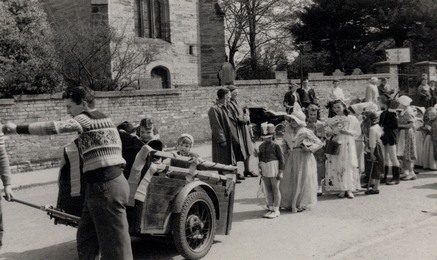 Soviet bloc countries refused to have anything to do with WRY, on the grounds that the ‘refugee problem’ in Europe could be resolved at a stroke if Western governments did more to encourage DPs from Eastern Europe to return to their homes. 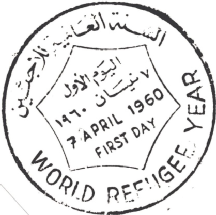 According to the UN office for WRY, public opinion had become familiar with refugees in the abstract: ‘through frequent repetition, the word ‘refugee’ had come to lose much of its poignancy, and there was little personal knowledge of the plight and sufferings of refugees beyond the immediate areas where they were living’. WRY aimed to rectify this situation. 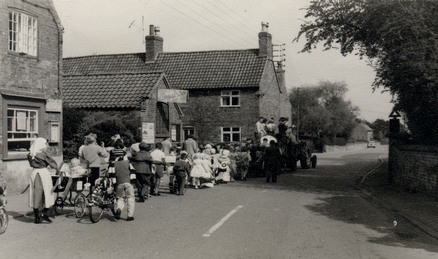 Various initiatives for fundraising were organised both locally and nationally, including one in Woodborough. Two photographs from that event bear witness to the excellent effort by villagers, many more photos of the day’s events are on our ‘Themed Photo Albums’ website. and right coming down Lingwood Lane towards Main Street.